ME Ph.D. student Sagar Chowdhury and ISR Director Reza Ghodssi. 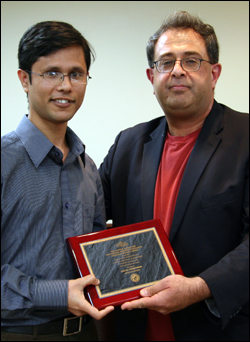 Mechanical Engineering Ph.D. student Sagar Chowdhury is the winner of the 2013 ISR George Harhalakis Outstanding Systems Engineering Graduate Student Award. Chowdhury’s research focuses on optical tweezers, a robot that uses a highly focused laser beam for precise manipulation of biological objects and dielectric beads at the micro-scale. He has developed an automated, physics-aware, planning approach for transporting cells in an optical tweezers-assisted microfluidic chamber. He also has developed a gripper synthesis technique for indirect manipulation of cells using optical tweezers, and a concurrent grasping and planning approach for automated indirect manipulation of cells. In addition, Chowdhury has extended the planning approach for automated indirect manipulation of irregular-shaped cells to study collective cell migration. Chowdhury enjoys working on interdisciplinary problems and collaborating with researchers from different backgrounds. He has worked actively in the Physics Professor Wolfgang Losert’s Cell Dynamics Laboratory to validate his path planner using a holographic optical tweezer set-up. Chowdhury interacts with Dr. Losert on a regular basis to resolve practical challenges in implementing his automated planner on the physical instrument. He has also collaborated with Prof. Amitabh Varshney’s group in the Computer Science Department in developing an optical tweezers simulator. Chowdhury has been a co-author in eight journal articles and seven conference papers during his Ph.D. work at the University Maryland. One of his conference papers was selected as the best paper at the ASME Computers and Information in Engineering Conference in 2012. He has also won three NSF-sponsored travel awards for presenting his works at IEEE International Conference on Robotics and Automation, the Conference on Performance Metrics for Intelligent Systems, and the NSF CMMI Engineering Research and Innovation Conference.